Custom wine facility Crushpad has a unique answer to the financial crisis, Bailout Wine. The wine is a Napa Valley Cabernet Sauvignon which will sell for $39 per bottle. But what makes this wine with the bear and bull label so unique is that for every 100-point drop in the Dow Jones from the date of purchase to the projected bottling date of August 14 2009, Crushpad will knock another $2 off the bottle. If the Dow rebounds the $39 price stands. 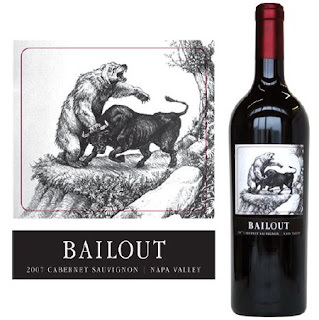 Only 500 cases of Bailout will be produced but the company could still take a hit if the Dow tumbles. For example if you bought when the Dow was at 8,800 and then on August 14, 2009 it closes at 7,300 (let's hope not) you would pay just $9 a bottle and get your $30 back. The wine will be shipped after it is bottled in Summer 2009.